The SEATCA board and team are happy to announce that effective 1 August 2018, Dr. Ulysses Dorotheo, SEATCA’s FCTC Program Director, assumed his new role as Executive Director, taking the reins from SEATCA’s Founder, Ms. Bungon Ritthiphakdee. Dr. Dorotheo joined SEATCA in 2006 and has more than 15 years of experience in tobacco control policy advocacy, involving networking, capacity building, and technical assistance through policy papers and briefings, regional and in-country workshops, and expert testimony requested by governments at the national and regional levels. His work revolves around the implementation of the various provisions of the WHO Framework Convention on Tobacco Control (FCTC), primarily in the ASEAN Region but also globally. 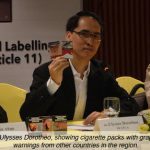 He actively participated in the development of the FCTC implementation guidelines for Article 6 (tax and price) and Article 11 (packaging and labelling) and previously led SEATCA’s Southeast Asia Initiative on Tobacco Tax, which contributed to the successful tobacco tax reform in the Philippines in 2012. He currently serves on the board of the Framework Convention Alliance (FCA) and Cancer Research UK’s International Tobacco Advisory Group. Ms. Ritthiphakdee, a 2006 Luther Terry awardee, founded SEATCA in 2001 and has since held the position of Executive Director. While continuing as a SEATCA adviser, Ms. Ritthiphakdee has assumed the role of Executive Director of the Global Center for Good Governance in Tobacco Control (GGTC), a joint initiative of SEATCA and the School of Global Studies at Thammasat University. Recently, GGTC was chosen as one of three key organizations that will lead Bloomberg Philanthropies’ STOP (Stopping Tobacco Organizations and Products), a global watchdog to counter the tobacco industry’s nefarious tactics of undermining tobacco control. We thank Ms. Ritthiphakdee for her many years of service to the organization and to the region.